Register your visitors quickly with the most advanced SignInMate™ solution for your business. Check the comparison matrix to see the capabilities of each SignInMate™ version. SignInMate™ is a visitor registration system that allows visitors to easily & securely sign into your office or workplace. The SignInMate™ solution has two versions: Professional & Enterprise. For more information on the versions of SignInMate™, please visit the SignInMate™ Versions page. For general SignInMate™ information, visit the SignInMate™ Overview page. If you wish to enquire about how SignInMate™ can work for you, or need guidance, please contact-us via our Contact Page. Replace your old sign-in sheet, visitor logbook and paper based records. 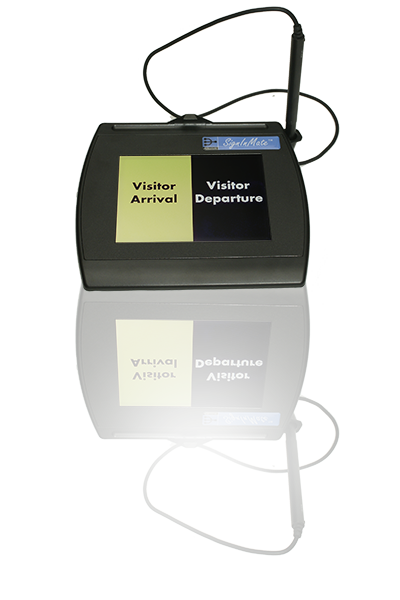 SignInMate™ is an automated electronic visitor registration system that allows visitors to easily and securely sign into your workplace. SignInMate™ is flexible, compact, easy to use and is ideal for small to medium businesses. The SignInMate™ registration package offers all the major features for today’s business needs. The digital records provide a resource of information with quick storage and accessible data for analysis and management. Manage your visitors as they arrive at your door, store their details and get their compliance to your Health and Safety requirements. Manage your employees with your stored employee listing, track time and attendance, and which visitors are with them. SignInMate™ captures the signature of visitors as recognition of your workplace Health and Safety needs. Immediate communication between visitors and staff allows them to follow your procedures. "How SignInMate™ can maximise your business? For maximum visitor authentications, SignInMate™ directs all visitors to read and sign their acknowledgement and compliance with your company's Health & Safety and evacuation procedures.